Gavin Moynihan was unable to undo a disastrous opening round at Leopard Creek. IRELAND’S HOPES AT the Alfred Dunhill Championship ended on Friday after Gavin Moynihan and Neil O’Briain both missed the cut in South Africa. The pair were up against it from the start after disappointing opening rounds at Leopard Creek CC and there was to be no miraculous turnaround on day two of the action. Moynihan endured a frustrating first day, shooting a six over par 78 which came as a result of a torrid back nine which featured three bogeys and two double bogeys. The Dubliner, who regained his European Tour card in Spain last month, shot a two under par 70 but it wasn’t enough and he finished his round two shots shy of the cut line and four over par overall. 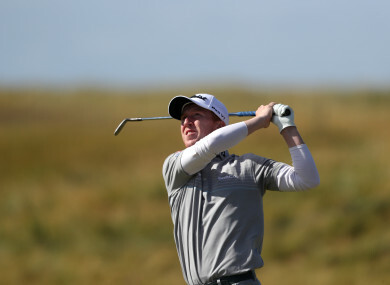 O’Briain, meanwhile, saw his chances slip away as he headed into the back nine in Malelane. A bogey on the 10th hole was the catalyst for a difficult run which saw him tumble further down the leaderboard and out of contention for a place in the weekend’s action. His second-round 74 saw him finish seven over par for the tournament and five shots adrift of the cut line. Meanwhile, a superb chipping and putting made American David Lipsky the second-round leader as title favourite Charl Schwartzel of South Africa missed the cut. Lipsky carded a flawless 66 that included an eagle and four birdies over the course of his Friday afternoon. “I have always wanted to come here because I heard great things about the venue from almost everyone,” said Lipsky. The former Masters champion has described the Leopard Creek course as his favourite in the world, but he didn’t click this week with the redesigned layout. With additional reporting from AFP. Email “Moynihan and O'Briain crash out of Alfred Dunhill Championship after disappointing second round”. Feedback on “Moynihan and O'Briain crash out of Alfred Dunhill Championship after disappointing second round”.